A very interesting lamp ! Can you believe that motion lamps originated as far back as circa 1930 and became extremely popular during the 1950's when TV lamps were in high demand. The shade was a drum style made with a louvered or fan blade top so that the heat from the bulb rising through the top louvers would slowly turn the shade. Some models had a translucent painted scene on an exterior shell which did not move and the moving painted or striated drum on the inside would imply motion to the painted scene. 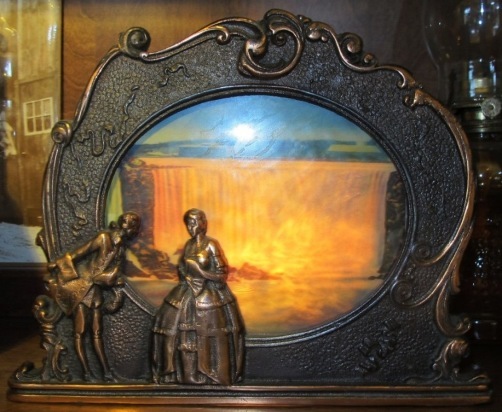 Popular themes were moving water scenes, rivers, Niagara Falls and a little boy peeing, ha! You can occasionally find one of these at an antique store or a flea market. It is very difficult to find one that works properly because many of the parts are easily lost or broken. You may also find one listed for sale on EBay. The nicer ones usually sell for many hundreds of dollars. Motion lamps are still being made today but unfortunately they are very cheap novelty models made in China and not something your grand children will be enjoying. I also locate special antique motion lamps for customers and I can be contacted through this website.